Next Vista for Education – What can video do for your students? Usually the conversation about “videos for instruction” get relegated to the tired conversation about whether or not students learn best from a video or their live teacher #flipclass. This isn’t what I’m talking about. I’m talking about students producing the videos… starring in the videos… scripting the videos. Now as you watch those, it’s fair to ask the question, “yeah but the students are simply going to watch an instructional video for a single skill, right?” And from a student learning perspective from the side of the CONSUMER, that’s likely true. And when you go to Next Vista’s website, you’ll see that it’s fairly simple to find videos, but it’s also that there’s lots of opportunities to submit videos. That’s where this conversation turns. When you see this from the side of the CREATOR, you get a whole different view. Rushton Hurley (the founder of Next Vista for Learning) has a line I’ve heard him use a couple of time: “When your students know their classmates and community will see their work, they want it to be good. When they know their teacher will be the only one who sees it, they want it to be good enough.” And I think that platforms like Next Vista can provide the space for students to invest their time and effort into learning math to the level needed to record videos that can help others learn the math that deeply, too. That’s something we’ve learned as math teachers. When you don’t know what you are talking about, that becomes a problem when you are trying to instruct someone else on that topic. By exploring creative outputs for our math learner, we are operationalizing that same truth. In order to create effectively to support learning, you have to have deep knowledge of the content yourself. And the prospect of deep math knowledge for our students is enough to get my attention. In the education world, “maker” as a vocabulary word seems very trendy, but the thought behind it really isn’t new. We learn by doing. We do by creating. The ability to create within the content requires connections among a variety of different related content pieces and often testing and trouble-shooting which are themselves tasks that require pretty significant understanding. So, it shouldn’t surprise us that creative activities seem valuable from a learning standpoint. What is significant is how satisfying they are for our students… 0r at least the advocates would have us believe. I was able to be a learner today in an all-day session regarding maker-style learning and this quote by Mark Hatch certainly got my attention. And it makes sense. Let’s remember that each of our students (and each of us) were CREATED. We were literally made by a MAKER. And we are not just made, but we are made specifically in the image and likeness of that maker. We are created to be creators. So, it should not at all be surprising that a day spent making is much less likely to feel like a day wasted. Perhaps our souls recognize that the time spent making is time that is bringing us closer to the image in which we were created. Time spent being who God made us to be. A chance to be our best selves. And isn’t that our job as educators? To help our students be their best selves? One thing you certainly can’t say about #TeamJXN (Made up of Kellie DeLosSantos, Alaina Sharp and Ann Smart) is that they aren’t outside-the-box thinkers. “Outside-the-box” is certainly well on it’s way to cliche status these days, but despite that, it still has a perfectly functional and relevant meaning. And at an EdTech conference, where so much of what we are learning about is touted as “outside-the-box”, what does it actually take to live up to that? It takes raptors at lunch. No, I don’t think all teachers should teach exactly the same. I’d like to unpack this statement a bit. Those who know me will not at all be surprised to find out that my thoughts need more than 140 characters to explain. Particularly when it is me explaining them. When we think of teacher accountability, explicit instruction, “non-negotiables” and the like, it can tricky to express how we are expecting all teachers to “do the same things” without making it sound like all teachers literally need to be doing the exact same teacher moves in their classrooms. The implication in that statement is that each teacher has the freedom and flexibility to answer the questions however they see fit. That’s where the individuality comes in. They only thing a teacher wouldn’t have the freedom to do is NOT have an answer. So, for example, in general for any given activity, you might envision something that looks like the picture on the left (credit: Wesley Friar) or the picture on the right (credit:Writing by Design) . Neither cooperative learning or guided individual practice are an absolute good or bad. So, the quality of the choice to use one or the other comes in the pairing with the desired outcomes. It’s the answer to the questions. What are you expecting the students to learn by the end of the experience? How does your strategy best support that? Where does that learning target fit in the bigger picture of your course? All teachers should be able to answer those questions for every lesson. This doesn’t mean that every lesson has to have a hard content target. It could be that the catapult activity on the right has a learning target of team-building, problem-solving, and effective collaborative creativity (as opposed to being able to model the path of the ball with a quadratic and solve math problems using the model). But then those are your learning targets and they need to be explicitly understood as such because of the next set of questions. How are you going to verify whether or not each student reached the learning target? What are you going to do for the students that haven’t reached the learning target by the time of the assessment? Anything worth making a formal learning target is valuable enough to ensure success for ALL students. This generally easier yet for content goals that are easily memorizable (Depth-of-Knowledge 1, if you’re familiar with Webb’s DOK Framework.) Name all fifty capitals is pretty easy to assess. As learning goals get more complex or individualized, they also get trickier to assess. As a result, it seems that fewer teachers are asking their students to do complex things. Or at least that is the perception. “Boss says that I need to be able to verify my student growth using data, then I better choose learning targets that are easy to track data on.” This is one of the reasons that “data-based decisions” has taken on some negative connotations particularly among teachers who have powerful non-content goals for their students. But this sets up a false set of adversaries in the struggle for school improvement. There’s no need to examine this as “things you can take data on” vs. “things you can’t take data on.” Instead, we need to be asking ourselves HOW do we assess our activity’s effectiveness in achieving the goals we have for it? How do you assess whether a student is growing in his/her creativity? How do you assess student’s ability to collaborate effectively? These are powerful questions. And, quite frankly, it seems like the design challenge involved in answering these questions might appeal quite nicely to the minds of the educators that are advocating for these types of learning targets. And in all this, we need to remember who we are fighting for. We take data because we need to know if our programs are helping our students grow the way they need to. Our students are too important to allow them to learn amidst ineffective programming. As a teacher, in many cases, I could decide to increase direct instruction an additional 15-minutes per day or add a weekly stop to the school makerspace or have the students start blogging. But, the reality of those changes and updates is that they need to be done FOR something. And while I support teachers’ abilities to make decisions about what bits best in their instructional plan, all teachers should know what the different pieces are for and should be expected to evaluate whether or not those different pieces are doing what they were designed to do for the students. In my last post, I looked at the characteristics of high-quality classroom instruction and discussed why I felt like those were essential regardless of the model any given teacher used. There were some excellent comments left after I posted that, so I’d encourage you to go join the conversation. What I didn’t discuss is the role of inquiry and the role of direct instruction. Each tool that gets wielded in a classroom is build to do a certain type of work. To maximize the effect, each tool must be used to do the job for which it was created. Direct instruction does one type of work. Inquiry does a different type of work. In order to highlight this difference, let’s consider a content standard. Give examples of linear equations in one variable with one solution, infinitely many solutions, or no solutions. Show which of these possibilities is the case by successively transforming the given equation into simpler forms, until an equivalent equation of the form x = a, a = a, or a = b results (where a and b are different numbers). Consider how we’d assess this standard. The students need to “give examples of”, which means they need to actively create something and explain why it’s the right kind of something. But, the explanation is predetermined. They can’t explain it anyway they want (according to the standard, at least). They need transform their example to match one of the stated forms. So, the final assessment of that standard (if we choose to assess it to the letter, so to speak), would include three equations that the student created and then evaluated in a standardized way to support their claim that their equations had one solution, infinitely many solutions and no solutions respectively. From my perspective, anytime the students are going to be expect to create something on the assessment, they will need some time to freely explore. You can’t assess a student on something they’ve not gotten the chance to practice. So, if you want them to create on the assessment, they need to practice creating. But we aren’t assessing their ability to create just ANYTHING. We want them to create strategically. There’s also that standardized evaluation process they’ll use on the equations they’ve created. While there may be some value in allowing the students to explore a variety of different, homemade ways to tell what their equations are going to do, in the end, we are going to ask them all to do the same thing. They need to be taught this process. Hang on… I need a quote. Based on his research, Rosenshine is saying that inquiry can work provided students possess the appropriate background knowledge. He isn’t the only one to say stuff like this. “[Content and creativity] drive each other. Students need a certain amount of content to be creative. Increased creativity drives deeper understanding of the content. This idea can be found within a variety of researchers in high-quality math instruction. Students need to explore. They absolutely do. They need to freely explore and play with the math. But in order for that to be effective as a learning tool, it really, really helps to have sufficient background knowledge. Be it the knowledge of algorithms helping to support and drive the problem-solving process, the math facts giving the elementary students flexibility, or in the case of our example 8th grade standard, a solid understanding of “variable”, “equation”, and “solution” to give the sufficient foundation on which to build their exploration. So, for this standard, I would probably recommend a direct instruction introduction to the standard that ends with making sure that all students are clear on the three essential vocab words as well as the evaluation process. Then, I’d move to an structured inquiry activity that led them through a chance to practice creating their own equations and evaluating them eventually leading them to make some generalizations about what equations look like when they have one solution, infinitely many solutions, or no solutions. I see the possibility for some small group discussions, reporting out… possibly a Google Sheet or some white boards and a gallery walk, etc. And from my chair, this exercise through this standard demonstrates the bigger picture. It isn’t whether or not inquiry or direct instruction should be used in eighth grade. It’s about what we are going to ask the students to do and which of those models supports the students best at which point during the instruction. It’s not about which. It’s about what… and when. Rosenshine, Barak (2012) “Principles of Instruction”, published in American Educator, Spring 2012 edition. Quote taken from Pg 12-19, 39. Quote taken from pg 12. Carson, Jamin (2007). “A Problem With Problem Solving: Teaching Thinking Without Teaching Knowledge.” Published in The Mathematics Educator, Vol. 17, No. 2, Pg 7-14. Quote taken from pg 11. StanfordSCOPE interview with Professor Jo Boaler. Quotes taken from times 2:40-3:20 in the video. I want to talk about vocabulary for a minute. Specifically, I want to describe one way that can support students struggling to learn vocabulary that is necessary for effective math talk. Often times, struggling math students are willing math talkers, but the math talk is filled with pronouns (that thingy right there, you know what I mean? ), hand gestures, and rough sketches. This can make communication a bit of a chore, especially if the student is talking to another student who is also still in the beginning stages of developing understanding in that topic. So, here’s a way that you can change the conversation a bit. Consider this handout combined with this Google Form. In short, the students would take a few minutes exploring different formal definitions for the vocab words you are exploring. There are always differences if you go to different sources, so by forcing them to explore a variety of interpretations, you can really help the students see that this vocabulary is about describing an idea, not memorizing a specific wording. This is important, at least to me. Pair the students up (or group them in 3’s) and have them consider the big ideas and develop their “own-words” definitions for each vocab word. Then they plug them into the Google Form. As you wander around listening to the conversations, you’ll likely notice a few definitions that are coming together more slowly than others. This is inevitable. At that point, I’d bring in Wordle. Wordle is a free tool that build word clouds. Word clouds can have a nice visual appeal and change the way a block of text looks by changing the physical size of a word based on its frequency in the text. For confusing definitions, this tool has the potential to help the students hone in on the big ideas. 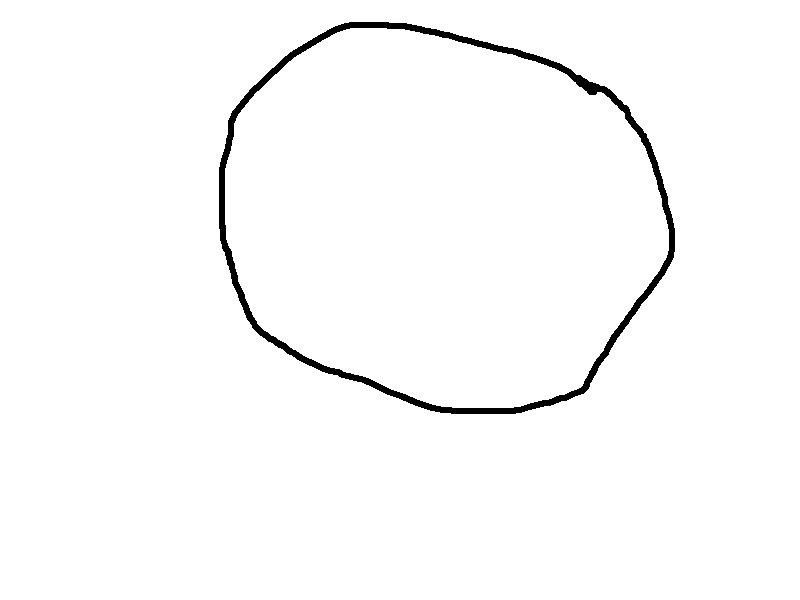 For my students, it was often “circle.” Most kindergartners could draw a decent circle (or at least a shape that you would guess quite quickly was supposed to be a circle.) But, that visual understanding is often as far as students get. Want to see how well your students understand what a circle really is? Ask them why this is a lousy attempt to draw a circle. See what they say. If your students are struggling with an idea, though, go into the Google Form responses, copy all of their definitions and paste them into a Wordle. My third hour Geometry last year, produced this word cloud. 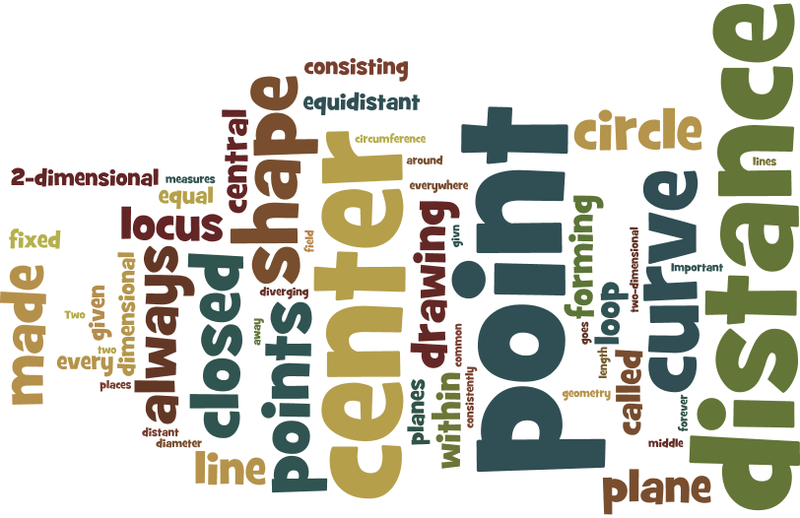 This isn’t going to solve all of your problems by any means, but with a visual like this, your students will have the opportunity to see that the major idea of this concept of circle revolve around the notion of a center point, a distance, and points in a curved shape. Those are major steps in the right direction when we are moving students away from a purely visual understanding of what a circle is and helping them understand the geometric properties of a circle. Remember, the goal of learning vocabulary is to facilitate student understanding of the content. Memorizing a definition only goes so far. We have to continue to develop the means to push students to internalize the bigger ideas within the vocab so that those words then become foundations to build more sophisticated ideas. If you feel like you’d like a tutorial of how to use Wordle, I went ahead and made one. When I think of a math activity that really flexes it’s muscles, I’m reminded of the activities that could reasonably be solved multiple different ways with no method being preferable on the surface. These are tricky to create (or to find and steal). They are also somewhat taxing on your students (especially if they aren’t used to this kind of problem-solving). It requires a more intense, higher-order level of thinking. Many schools are reaching the stage where students are carrying around smart devices. Increasingly schools are issuing them (we are up to 4 districts in our country that are now 1:1). Also, in many districts, students can be trusted to bring smart phones in with them. With all of these devices available, it seems like we could integrate a new set of tools into our tool box for consideration. We should design activities that allow the students some control over what mathematical techniques they choose to employ. But increasingly, it’s making more sense to also allow the students some control over what tech tools they are making use of. That is a nerve-racking idea for some, especially since as soon as students start dabbling in technology that the teacher is unfamiliar with, they become their own tech support. There is a very real (and perfectly understandable) anxiety over students using technology pieces that the teachers aren’t familiar with. But we could flip that on it’s head. First, we could model some of the tech pieces that we are familiar with. Consider an activity where in the students use a Google Form to poll their classmates, then enter the data into a Desmos sheet to do the analysis. The formative assessment of the analysis could be done on Socrative or Google Forms. Then, when we unleash our students to solve a problem by any means necessary, with a proper foundation underneath them, we run a much lower risk of them choosing something completely off-the-wall. Students might replace our technology with choices of their own, but if they know that we have a standby that will work, then often the replacement is something they find more useful… and it might be something we’ve never seen before… and they might be able to teach us how to use it. And never underestimate the power of allowing a student to be the expert in the room once in a while. Full disclosure: The data that I plugged into the Google form came from here. Many thanks to cpears93@stu.jjc.edu who is named as the owner on the site. Why do we collect student work? Why aren't more people talking about this? Dan gleeballs on Sky Dive Trampoline: Real or Fake? Andrew Shauver is an instructional tech specialist, and former HS and MS math teacher in Mid-Michigan.